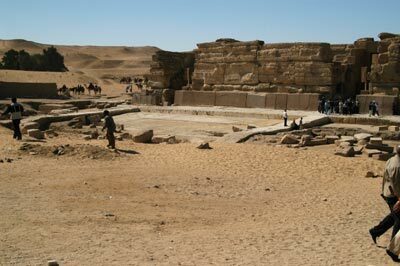 Ther is a small temple near the Sphinx, which is almost completely gone. SOuth fo this, is the Valley Temple of Chephren, a small square temple that is almost entirely undecorated. 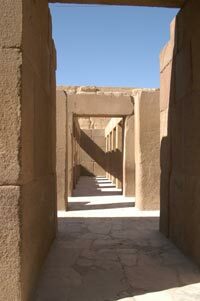 The temple is made of enormous blocks on the interior -- some of of the largest blocks seen in Egyptian architecture. 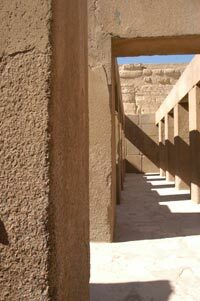 Most egyptologists believe that these rae blocks left over from the excavation fo the sphinx. Some of them weight hundreds of tons, and they are cut into odd shapes to fit together perfectly. Our guide, Fateh, insists that they predate the stone cutting in Mayan pyramids and temples, which have similiar stone techniques. 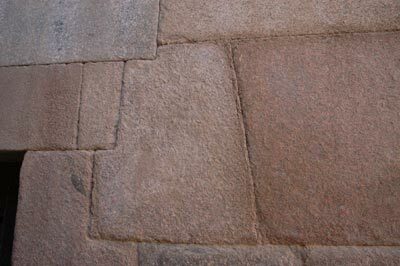 Based on the strange corner joints -- it would seem impossible that crews of workers with bronze tools could measure, built, and set these enormous stones. It is more likely that they were laid in levels and smoothed after they were set. The amount of work to "carve" the room from the blocks is amazing. Inside, it is faced with granite (the ouside cladding having disappeared to stone thieves in the intervening centuries), and square, perfectly aligned columns. Originally, 23 statues would have been found in this room, each lighted by a window over the lintels. Only one of these statues was every found, and it was found upside down in a pit nearby. No one knows why.